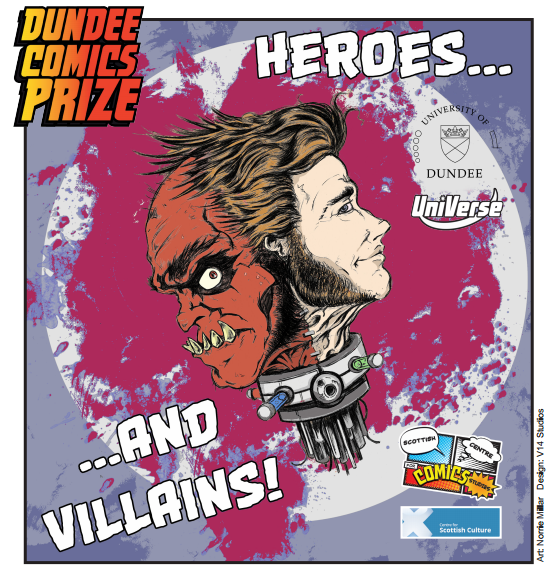 The University of Dundee’s Scottish Centre for Comics Studies and the Centre for Scottish Culture have teamed up to make October 2014 “Heroes and Villains” month, and this will be the theme of the 2014 Dundee Comics Prize. entries can be in any genre, but must respond to this theme. The first prize is £250, plus publication of the story in Tales of the Universe #2. (Find out more about Tales of The Universe #1 here!) There will also be a runner-up prize of £100, and this will also be published. You can keep up to date with contest news on our facebook page. scholars, with the announcement being made at Dundee Comic Day, on October 26th 2014. The winner and runner-up will be invited to attend. The aim of the Dundee Comics Prize (affectionately known as the tartan bucket prize) is to promote new talent in comics, and to help creators gain recognition. Anyone can enter the competition, and the submission can be in any style, in black or white or colour, but the work must be finished to a high standard (lettered, inked, etc), and it must be a complete story. The length should be between four and eight pages. The maximum length is eight pages, although one page can be a cover image, although this not essential. If there is no cover provided the title and credits must feature on the first page of the story. The work must be original, the creators must own the copyright, and it must not have been published already or be currently offered for publication elsewhere. When submitting the entry good quality electronic copies are requested in the first instance. Note: the prize is awarded to the creator or team who produce the work. If the work is collaborative the members of the team will share the prize money equally. The winners will be asked to provide a short account of how the comic was created, along with any relevant photos and sketches. these will be used here on the Scottish Centre for Comics Studies website and for promotional purposes. print size is 162 x 240mm (3mm bleed, 168 x 246mm). at least 300 dpi cmyk, saved as a high quality pdf or tiff.